When booking flights to and from Canada, you might want to fly WestJet. On a recent trip to Toronto, we opted to fly WestJet Flight WS 1217 from NYC LaGuardia Airport. WestJet is a Canadian low-cost carrier (second largest next to Air Canada). Although it didn’t offer as many scheduled flights as Air Canada between New York and Toronto, the round-trip fare savings on WestJet was substantial, about $100 less per person. Our plane departed from Terminal C, one of the older terminals at LaGuardia. WestJet flies to some 80 destinations in North America, Central America, and the Caribbean and partners with U.S.-based American Airlines and Delta. 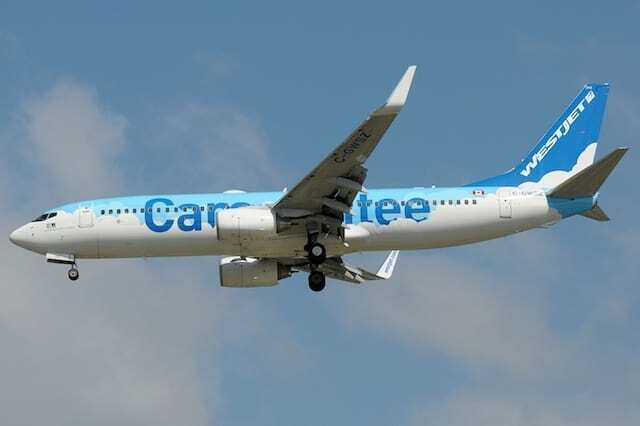 The fleet includes both Boeing 737s and Bombardier Prop Jets. Our leather seats offered reasonable legroom and were average-sized in width. They were configured 3 plus 3 on both sides of the aisle, but with a half-empty plane we were lucky to score an empty seat between us. We were only able to reserve seats online when we checked in, 24-hours before takeoff. Each passenger is allowed to carry on up to 50 pounds of checked baggage and one carry-on free, liberal by most airline standards these days. A nice surprise once on board is the overhead bins are more than ample in size. Flight safety instructions are offered in French and English. There is free satellite TV in the seatbacks (although it wasn’t operating on our international flight). On longer international flights, movies are free of charge. As a travel writer, I’m always delighted when I‘m able to find a print magazine in the seatback pocket. This one is aptly called up! Even though our flight was only one hour and four minutes, friendly and efficient flight attendants offered passengers a choice of complimentary red and white wine, two kinds of beer, or water (no soft drinks). On certain flights originating in Toronto, guests can pre-purchase and order snacks before boarding at a discount from buying them on board. Because of threatening weather, our flight departure from Canada was delayed about 20 minutes but we were kept well informed of status changes. It’s hard to judge a one-hour flight: You board, take a sip, and prepare for landing. But we were pleased with what we received for our money and would definitely fly WestJet again. This is one of a series of posts about my experiences on new-to-me airlines. Surely, each flight is different but it’s always helpful to get general impressions of what to expect before you fly. If you fly WestJet and have a very different experience, please feel free to comment below. What’s it like to fly Swiss International Airlines? What’s it like to fly Volaris? Hi Irene. I LOVE Westjet! Being Canadian, I fly WJ frequently and they are almost always on time or early in their departures and arrivals. They never oversell a flight and I love the great prices, their reward system, and friendly staff. Their online magazine is now called Westjet magazine, and you can reserve seats ahead if you pay $10 pp. Otherwise, you can nab your seats 24 hours in advance at no cost. Good to hear from a frequent flyer, Doreen!